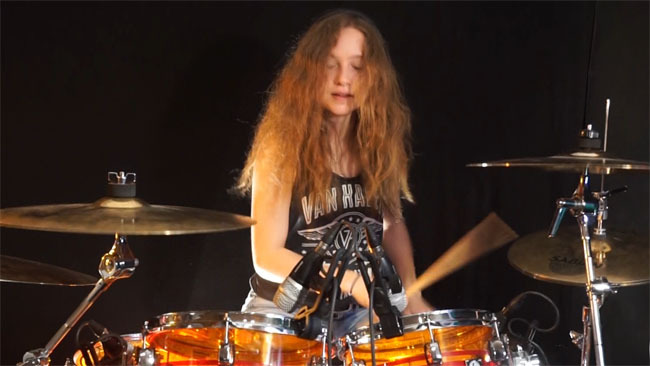 Sina Doering started playing drums around the age of ten. She is the daughter of musicians and lives in West Germany. Sina's father, Michael Doering, professional name Mike Wilbury, is a live and studio musician and also a songwriter and music arranger. From 1999, the year Sina was born, until 2009, he toured Europe with a Beatle's tribute band. When Sina was six, her father recorded a children musical, A Toy Soldier in Love where Sina served as a model and actor. He and some English musicians also put traditional nursery rhymes and German nursery rhymes to music with Sina singing back up vocals. Around the age eleven, after a year of intense training, Sina started providing drum tracks for artists that her father was recording, such as Irish singer/songwriter Briony Williams' album Solstice, which Sina considers "the first real album" that she played on. Both girls were around fourteen-years-old at the time. Also around then, Sina's YouTube channel went online September 2013. The first video of Sina was here drum cover of Dream Theater's "Metropolis Part 1: The Miracle of the Sleeper." The response was so great that other drum covers followed. Most at the time were covers of Dream Theater's songs, however Sina insisted to me recently that she is not just a "metal chick." She is actually a chameleon when it comes to the drums, playing anything from classic rock to hard rock to radio pop and all points in between. This can be seen, not only in the many covers that she has done, but also in her original songs, such as "Fire" and "Summer Salsa." Sina also has ten drum tutorials where she teaches the viewer how to play some of the many drum covers that she does. The tenth and final in the series, "10 Styles of 10 Popular Drummers," shows off Sina's chameleon drum talent. Another set of videos that demonstrates what can only be called 'a Sina Doering original drum technique' are ten videos that Sina puts guitar riffs down as drum parts. She calls this technique, 'a new approach to Melodic Drumming.' Some of Sina's "guitar riff drumming" demonstrations include Deep Purple's "Smoke on the Water," The Beatles' "Day Tripper" and Led Zeppelin's "Whole Lot of Love" just to name a few. Sina has done a lot of collaborating on her video channel with many other YouTube artists from all over the world. The collaborations have been mostly covers, but Sina wanted to create something original, something that hasn't been done before. After a little over a year of recording, the result was The Chi-Might Project, released on June 2016. The Chi-Might Project is a collaboration of musicians from all over the world via YouTube. The album contains fifteen original songs by the artists that are featured, plus some original material written by Sina's father with Sina on drums and percussion (plus occ. bass and backup vocals) being the connection throughout. The Chi artists include Lauren Isenberg, a thirteen-year-old singer from Canada, singing a Mike Wilbury song, "Doing The Wrong Thing The Right Way," a soft-rock, jazz-infused number and Kara Glazer, a fourteen year old singer song writer from the US, singing and playing the piano on an original song of her own, "Fate." There's also a fast-rocking number called "Speed Up," written by Denny Anthony from the US on vocals, with Dennis Hormes from Germany on guitar, Samuel Bass from Argentina (who now lives in England) on bass guitar and Mike Wilbury providing rhythm guitar and also helping with music arrangement. Other artists and tracks on the on the Chi-Might Project CD include "Twenty-one Eleven," an instrumental by piano virtuoso Mark Moody, "Shipwrecked" by The Lovac Brothers, "Merry-Go-Round" by Romanian singer Daria Stefan and many others YouTube sensations from around the world. Sina has said that the name 'Chi-Might' can be interpreted two ways; 'Chi' in Asian philosophy and medicine means "Life Energy" or "Life Force" and the word 'Might' is self explanatory, as in strength, so Chi-Might could mean the "The Strength of Life." Also, 'chi' sounds a lot like 'she' to Western ears, so the name could mean that, "She (Sina) is Mighty" or "She might or she might not, you can never tell." Sina's latest collaboration album, Your Songbook (Best Covers of 2017) is (as stated) an album of covers that features eleven-year-old Canadian singer Jadyn Lee doing three covers- Metallica's "Nothing Else Matters," Simon and Garfunkel's "Sound of Silence" and a gorgeous version of Led Zeppelin's "Stairway to Heaven." The CD also features two Beatles songs, "While My Guitar Gently Weeps" preformed by Lauren Isenberg and "Something" preformed by singer-songwriter Avonlea from Northern California. Other cover songs on the album include Heart's "Barracuda" preformed by Australian singer-songwriter Victoria K with bass player Miruna Harter and guitarist Andrei Cerbu, both from Romania and both are members of the Romanian-based band The Iron Cross. Other covers include Alana Miles' "Black Velvet," Dire Straits' "Brothers in Arms" and a cute rendition of Peggy Lee's "Fever" preformed by New Yorker Evah Fevah. With their variety and breadth, both The Chi-Might Project and Your Songbook (Best Covers of 2017) are worth listing to. Both CD's feature musicians that are masters at their crafts, some are very young, but surprisingly very professional. Both CD's also have one important special feature- Sina Doering playing drums throughout. Sina Doering at eighteen has brought together people from different countries and walks of life together with one main thing in common- their love of good music. When asked if there will be another Chi-Might Project, Sina says "It's quite possible that we start working on another original album after that. It's not quite clear yet if we will follow the Chi Might concept or if we will work only with one or two artists the next time. The future will tell." If you would like to learn more about Sina, her drum tutorials, her videos that feature her original songs and drum technics, plus videos of The Chi-Might Project and Your Songbook collaborations as well as other collaborations or purchase her CDs, you can visit her website https://girls-got-groove.com/home/ or her YouTube channel at https://www.youtube.com/user/sinadrumming.